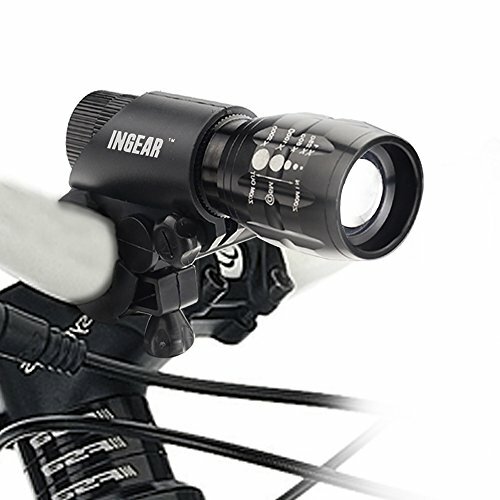 The INGEAR DUAL PURPOSE Bike light offer a lighting solution that delivers bright beams from rated at one hundred and fifty lumens with three high quality LED bulbs with telescopic zooming capabilities. The brightness are adjusted in three modes of Dim, Flash and High Intensity thereby allowing for better management of battery power consumption. This light performs a dual function as it can be used as a flashlight and also as a headlight. Attaching or detaching this light is super easy requiring no tools as it utilizes a quick release mechanism to achieve this. It comes with a tail light for free which can be attached to the rear of your bike to allow for you to be visible at night to traffic behind you thereby improving your safety on the road. Manufactured from a durable and high quality material that is resistant to harsh weather and built to last long. Easy to attach and detach, requiring no tools and can be used as either a hand-held flashlight or bike mounted head light to offer powerful illumination rated at one hundred and fifty lumens. Operable in three light modes of Flash, Dim and High Intensity. Comes included with a free tail light together with batteries. 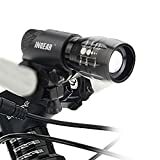 The INGEAR DUAL PURPOSE Bike light is a very durable and nice product that offers bright light and comes with an easy to operate single knob for switching between the three light modes. It can be easily attached to bikes with a quick release mechanism and used as a headlight while also serving as a hand held flashlight. The light comes in a metallic body and looks tough. A wrist strap is included but it looks fragile and won’t last long. This unit is powered by three AAA batteries and the light is zoom-able to allow for increasing or decreasing the beam spread as required and this function is operated manually. It also comes with a free tail light that is operable with two AAA batteries, included together with the unit, and it also offers three different light mode and they function well to make you visible to traffic behind. This Ingear bike light offers a decent dual purpose bright light and if you are considering investing in one for yourself, this should be a good option.